The Fantastic Four (2005): I was looking forward to seeing this film when I first heard about its release, but was a little skeptical due to the casting of the Invisible Woman and Thing. Still, it looked interesting enough to watch and I'm glad I did, because it was much better than anticipated. If you are not aware, there WAS a Fantastic Four live-action film made in 1993 that is unreleased. It's quite good despite the fact that they had to operate with a low-budget (about 1 million), but it's worth watching. Although the look of some of the characters is a little bit different than expected (that is, if you remember the comics, cartoons, or previous film), this movie was still able to retain enough of the qualities that FF is known for to make this show interesting and worthy of watching. For instance, Mr. Fantastic's intellectual intensity, the animosity between Human Torch and Thing, Johnny's famous "Flame on!" and Thing's famous "It's clobberin' time! "...all of that is here. The Fantastic Four gets their powers in a cosmic accident (like in the comics), but Victor Von Doom gets his powers in the accident, too. The fact that Doom gets his powers in this event is a bit different from the comics, but it DOES bring everything together. I like it the writers did this. Also, the cosmic accident does not happen in a spaceship with the FF members (like the comics), but instead on a space station owned by Victor Von Doom. That makes things more interesting, too. What I thought was really nifty is that Victor Von Doom becomes living metal with the powers of conducting electricity. In all other versions of the character, Doom is wearing a suit of armor. In addition to this, for most of the movie we actually see what Doom looks like before he dons the famous metal mask. In fact, we don't see the mask until the final scenes of the film...as well as his famous cloak. This is the first time, really, that we ever get to know what Doom was like before his supervillain days. It's good that he's given a background in the film, not just a flat character that just happens to "be there". The 1993 film also did a good job of giving Dr. Doom a background story. It's plain to see that this movie has a lot of openings for a second film, with the uncertain "death" of Dr. Doom. 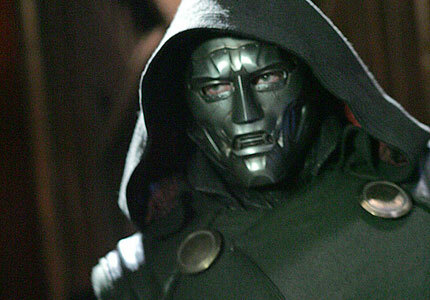 Incidentally, he hasn't even been referred to as "Dr." Doom yet. But hopefully, the next film will include at least one other villain, too. Ioan Gruffudd plays Reed Richards/Mr. Fantastic and I'm very satisfied with his portrayal. He looks enough like the popular character, but it's his acting that REALLY makes the Mr. "Fantastic". Very psychologically intense...everything's facts and figures. Ioan captures it perfectly. Chris Evans plays Johnny Storm/Human Torch. Now, Johnny was always blonde in every other version of the character, but here he has dark hair. Not a big deal, really, just something different. But he's really great in the way that he plays this character: cocky and overconfident. And there is also the halfway-friendly jabbing between him and Thing. I think it's the successful interaction between Johnny and Ben Grimm/Thing that really makes his portrayal of Human Torch a success in this film. That's because he has the most one-on-one involvement with Thing over any other character. He doesn't have too much to do with his sister Susan and even less with Reed, but he's ALWAYS hanging around Ben. Jessica Alba plays Susan Storm/Invisible Woman. I really didn't think she was going to be right for this part at first. I don't have anything against her, but she really didn't seem the "look" or the "personality" of the character. She did a good job, however, and I'm happy with it. They made her look enough like Invisible Woman by making her hair blonde and lightening up her skin a bit. Truth be known, though, I still don't think she captured the comic character's personality, but that's okay, because she gave it a different one that worked in this movie. Susan Storm, in this story, is by no means passive or bubbly or easy-going. And you can see why, because she is so frustrated with Reed for much of the movie...as she should be given the circumstances. Michael Chiklis plays Ben Grimm/Thing. I'm still not sure what inspired the filmmakers to say to themselves: "I know, let's get Michael Chiklis to play Thing!". Surprisingly, he did a good job with it, but you certainly would not expect him to be cast as this character. Ben Grimm was always a tall, dashing man with a muscular build, wavy brown hair, and blue eyes. Chiklis did not have those qualities here. In fact, he was even bald! But I was satisfied with his acting as Ben Grimm in human form and as Thing. In fact, the more you see him on screen as either Ben or Thing, the more you like him and the more you can empathize with this character. Julian McMahon plays Victor Von Doom to sinister perfection. I think out of everyone in the cast, he had the hardest job of satisfying audiences because he had to play Victor Von Doom in human and semi-human form for most of the movie, instead of the highly anticipated "Dr. Doom" that you see in the film's final scenes. 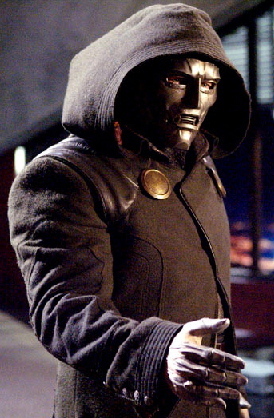 Anyone who knows the character from elsewhere is expecting to see Dr. Doom in his costume for most of, if not all of the movie, and it's not always easy to engage audiences so used to seeing a character in one way. However, I LIKED it that we got to see Victor Von Doom in human form, gradually becoming the famous supervillain, finally culminating into his most extreme form as the all metal, dressed in hood and cloak. We see a guy who was already a bad person to begin with, but not yet a killer. Then after his accident, we see Doom deepen into his madness until he realizes that he can finally act out on his god-like fantasies. Awesome! This is a fun superhero movie that anyone can watch (the material is pretty clean) and I also suggest that you see the 1993/94 "Fantastic Four" film if you can.